So there's this youtuber I use to watch called Darksydephil, he is one of my favourites, maybe even #1. He plays games, and over the years he has made around 50k (that's right) videos. He has a decently big fansbase, not the biggest but many of his fans are kind of big fans of him. 184+k subs on his main account. He is a very funny and nice person, and he's known for being honest. He has several channels but the biggest ones are DSPGaming, KOgaming and THEKINGOFHATEVLOGS. However, what's the point of all this? Yeah, I thought to myself; what if we could get Phil to play 8bitMMO! Then maybe many of his fans starts playing it aswell! PS. At the end here I'm gonna make a little bit of advertising for Phil ofcourse im not paid to do this, im just doing it cause he's so awesome . Phil's girlfriend Lianna sells highqualitative soap, and it got ONLY positive reviews, it's loved by everyone who buys it! She also sells waxtards which are kinda similar to scent candles but they're much better! Let's unite, and revive 8bitMMO!!! That's not a good idea. Fans (And the youtuber as well) will bring so much hype that the game will gain much more hate. Updates could be a factor for players who play a long time, but not for new players within the first few days (I checked the stats, and there hasn't been any notable change in the one day retention metric since the last period of regular updates). We've always had a problem with most players quitting within the first few minutes, sometimes before they even leave the first room in the tutorial. Lack of updates is only creating a problem in not being able to keep active players around. The game will obviously get boring to players who have played for a long time and know the "ins and outs" to the game. However a new player, who still hasn't learned all the "ins and outs" to the game, will often stop playing the game quite early on due to the difficulties of building. 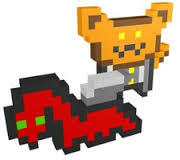 (using z-axis is quite confusing) New players also may be leaving the game because a majority of them are young, and obviously young kids won't understand the complex mechanics required in 8bitmmo, and most young players will have played the game known as minecraft, which is similar to 8bitmmo in some respects. New players also have a lack of other people to interact with. I remember when i first started the game, one of the reasons why i continued to play after the tutorial was because i got to interact and build with other people. However, the game in its current state is not able to meet this, as the player base is quite low. This brings us back to the problem of not having enough active players. One of the quests is to ask in chat for a mayor or something like that, but what if a new player logged on and he was the only one online? or maybe there were one or two other, but all of them were new? At the moment it isn't uncommon to find under 5 people online at a time, so what kind of message does this send to new players, who are already frustrated over the difficult mechanics of the game and just want someone to help? If we could get more older people to play the game, then the player base would most likely increase, but once those players know the "ins and outs" to the game, what then? So obviously some updates along the way would be needed, it doesn't even have to be big, maybe add in one new block. A single new block could create enough hype to keep players around for longer, and the block could literally be like cement but with a different texture, so it probably does not need a lot of coding. New players are not staying around because not enough active players and the game is too difficult without the help of others. Old players are not staying around because they have "completed" the game in the sense that they know nearly everything about it. Not enough updates. This obviously causes old players to leave the game, since the game feels "stale" and "old" to them, which in turn decreases the amount of new players who stay around, due to the low player base. To new players, 8bit"mmo" feels more like 8bit"single player"
Sim9 as someone mentioned somewhere I think you should add some updates atleast like a new block every once in a while. And well the ones who watch this youtuber, of course there are young ppl, but I think plenty of them is a bit older, so maybe they have the patience to learn? Having a youtuber do a video is a double edged sword. Yes it will make the game more noticed and more people might show up BUT that also brings trolls and more people that could dislike the game. Not to mention if the reviewer him/her self doesn't like the game it makes it worse. I realize your heart is in the right place but it's best to let it be and see where things go. Ultimately as sim pointed out the biggest problem is players don't stick around and even those who do do so for maybe a week or two at most and move on. I really think the biggest issues are. A: Lack of Mayors and in general players. People come on and I have seen a lot of people asking for a place to build and a lot of the time they are ignored or told there is none available. Also a lot of times people come on and see no one else. Even though this is not needed and there is the wild and pockets. It seems noobs are under the impression you need to be a citizen. B: Construction can be difficult to learn. I find on average it takes about 3 days to really learn the game and building. C: Lack of reason to continue to build. You come on maybe last long enough to build whatever maybe a home.... Then what... Even if you own a town there's no real incentive for anything... Two of the best things you can have is a gold farm or a shop with buy boxes but to have a solid shop you need to spend a great deal to get the boxes and supplies. As for the zoo you need to spend a great deal on the spawners and mysteryboxes so that you can have more than 8 in the same area. and it's really difficult to come up with legit ways that can't be abused to fix these issues. D: Plat. Although it has gotten a lot more reasonable and if the new plat system gets added it will be even better. The fact still remains as soon as people hear you have to spend money on anything it drives people away. E: Regardless of how much has been added over the years there REALLY isn't much to do. Yes there'0s a ton of player made quests and a ton of reward blocks to obtain but MANY of the quests are ridiculously too hard or confusing. Some may not even be possible. Sure that's not allowed but some people might have made some that don't get reported. Same with the use of fee doors. The lvl cap is only 6 and although that is fine for what there is in the game that just shows how little there is. This is a difficult conundrum. If you don't, the game fades away. to help keep them in, this is gonna be difficult. Idk. I'll suggest more things here if I come up with more ideas. I've played this game for a while and I've seen many great builds, and I'll be honest: the tutorial is not one of them. If the tutorial and root got rebuilt to look as good as Thunder Moon or Elysium a lot more players would probably give this game enough of a chance to maybe get hooked on it. No. The game doesn't need new players, just improvement. When the inprovement is done, then the players who quitted will come again, and some new players will come in too. If you get more players (+ Demand) and do less updates (- Supply), the players will quit. Now, for the example, we're on a pretty high demmand and very low supply. That means that very low players will play. "I don't think more new users is the solution -- we actually still have a lot of new users registering each day (around 100)." I am going to try and keep this argument from hurtling into the deep end with this wise statement. "Update it, an they will come." How the heck is anyone who has not played this game before supposed to enjoy it when the most recent up was a bug update. Even wizard 101, which has not gotten a content update in who knows how long, always gets a small update at the holidays like Christmas and Halloween. We only get it at most once a year recently. This is the solution we need first, followed by erijon3's solution, then onto another solution, till the game is revived. Heck, even if this pateron thing works, that will help in the long run. Without updates, none of the other solutions will ever last very long. I've added my two cents, so I stop this post here before I start ranting. "they are only temporary" is what I meant. wizard 101 gets an update at xmas, like a new spell, and that spell never goes away. I've played this game for a while and I've seen many great builds, and I'll be honest: the tutorial is not one of them. If the tutorial and root got rebuilt to look as good as Thunder Moon or Elysium a lot more players would probably give his game enough of a chance to maybe get hooked on it. It has already been made apparent that Robby has no intention of changing root or the tutorial. Why is this case? I haven't a clue. But I wouldn't have given up if there remained the slightest chance for this particular aspect to see improvement. Most people are simply overlooking the fact that a single change of first impressions can make a fantastic difference in the playability of a game.